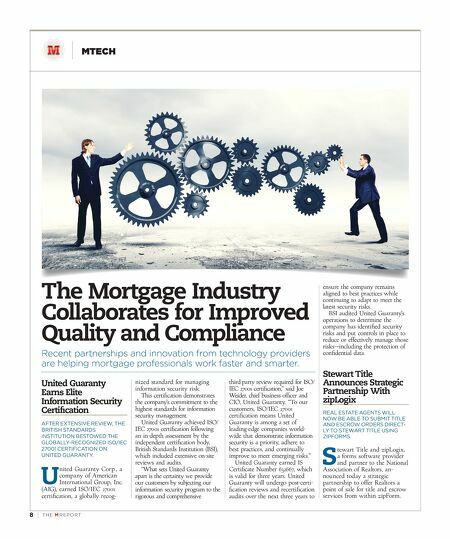 8 | TH E M R EP O RT MTECH The Mortgage Industry Collaborates for Improved Quality and Compliance Recent partnerships and innovation from technology providers are helping mortgage professionals work faster and smarter. United Guaranty Earns Elite Information Security Certification AFTER EXTENSIVE REVIEW, THE BRITISH STANDARDS INSTITUTION BESTOWED THE GLOBALLY-RECOGNIZED ISO/IEC 27001 CERTIFICATION ON UNITED GUARANTY. U nited Guaranty Corp., a company of American International Group, Inc. (AIG), earned ISO/IEC 27001 certification, a globally recog- nized standard for managing information security risk. This certification demonstrates the company's commitment to the highest standards for information security management. United Guaranty achieved ISO/ IEC 27001 certification following an in-depth assessment by the independent certification body, British Standards Institution (BSI), which included extensive on-site reviews and audits. "What sets United Guaranty apart is the certainty we provide our customers by subjecting our information security program to the rigorous and comprehensive third-party review required for ISO/ IEC 27001 certification," said Joe Weider, chief business officer and CIO, United Guaranty. "To our customers, ISO/IEC 27001 certification means United Guaranty is among a set of leading-edge companies world- wide that demonstrate information security is a priority, adhere to best practices, and continually improve to meet emerging risks." United Guaranty earned IS Certificate Number 632667, which is valid for three years. United Guaranty will undergo post-certi- fication reviews and recertification audits over the next three years to ensure the company remains aligned to best practices while continuing to adapt to meet the latest security risks. BSI audited United Guaranty's operations to determine the company has identified security risks and put controls in place to reduce or effectively manage those risks—including the protection of confidential data. 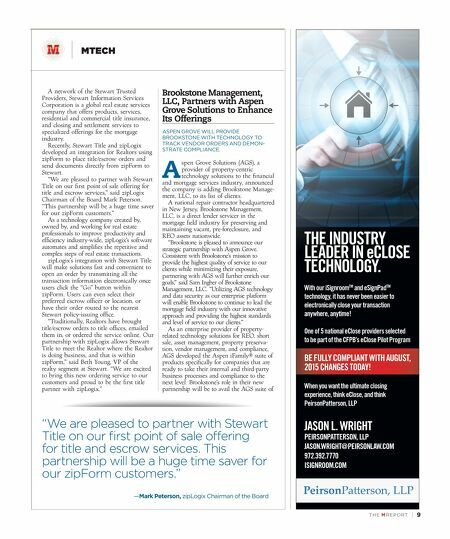 Stewart Title Announces Strategic Partnership With zipLogix REAL ESTATE AGENTS WILL NOW BE ABLE TO SUBMIT TITLE AND ESCROW ORDERS DIRECT- LY TO STEWART TITLE USING ZIPFORMS. S tewart Title and zipLogix, a forms software provider and partner to the National Association of Realtors, an - nounced today a strategic partnership to offer Realtors a point of sale for title and escrow services from within zipForm.